As the Republican leadership of the 115th Congress prepares to fulfill US President-elect Donald Trump’s campaign promise of repealing and replacing Obamacare, Democrats are digging in to defend President Barack Obama’s signature healthcare law. Following a two-hour meeting with Obama on Wednesday, the congressional Democratic leadership accused the Republicans of wanting to “make America sick again” and throwing the US economy into chaos by repealing Obamacare, officially known as the Affordable Care Act (ACA). Senate Minority Leader Chuck Schumer (D-New York) described the GOP as the “dog who caught the bus” and then doesn’t know what to do with it. Repealing the ACA would cause insurance premiums to skyrocket and hurt rural hospitals in the Republican heartland, he argued. “President-elect Trump made it clear that we would not have people dying in the streets, and we are going to hold him to that,” Cummings said. The Republican majority, on the other hand, is determined to dismantle Obamacare as soon as possible. Vice President-elect Mike Pence made the emphatic announcement at a press conference Wednesday, flanked by the House GOP leadership. On the other hand, Pence cautioned that the GOP plan is still in the works and that the Trump administration wanted an “orderly transition” to avoid inflicting additional hardships on families endured under the ACA. 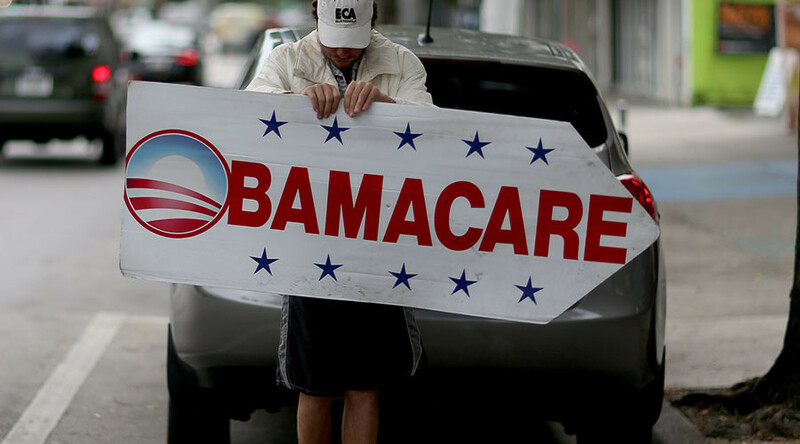 Obamacare is literally the government FORCING you to by something you don't want to buy. Then raising costs. Expensive govt coercion.